Opium's chicken & sweet corn soup to lift your mood. Shrimp, chicken, beef and mushroomin a thick spicy brown broth. A simply delicious soup created by our chef. Assorted seafood, raw meats, sea fungus & seasonal vegetables served with your choice of broth to cook on the induction table in front of you. Chinese soup popularity known as 19B is a combination of chicken, prawns and black mushrooms. A favourite! A szechuan recipe perfected by opium. For those who relish a clear soup with crispy rice. Atlantic lobster prepared in your choice of curry or stir fried, for that special occasion. Sauteed seasonal vegetables, straw mushrooms, artichokes bamboo shoots & young corn in garlic butter sauce. Batter fried chunks of fish fillet served with caramelized tamarind spicy sauce. Sauteed seasonal vegetables, straw mushrooms, artichokes, bamboo shoots & young corn in garlic butter sauce. If you love prawns you will love Opiums recipe for lightly battered prawns with a delicious sweet chilli sauce. Steamed mixed meat & sea food dumplings with a strong Pan Asian influence sauce. A flavorful appetizer, crisp and light, stuffed with vegetables and chicken. Famous flowery thai fritters, stuffed with mixed meat and seafood, served with sweet sour & spicy pineapple sauce. Delicious fried chicken drumsticks flavored with a seasoned flavor coating. Opium's innovative pairing of prawn and toast. Our Prawn on toast is sure to surprise you! Itâ€™s a great little dish, with a little bite of pepper that is quite addictive. A simply delicious soup created by our chef. Chinese eight treasure soup is a delicious combination of nutritious vegetables and chinese people prepare and serve this soup for their special and auspecious occassions. For opium's health concious guests. Based solely on broth and lacking in dairy products such as milk or cream or starch. Shrimps minced with thai herbs and spices rolled in crunchy popcorn crust & deep fried. A superb starter, stuffed with shrimps plus thai herbs and pepper are sure to tantalize your taste buds. Deep fried prawns which are a seductress to the taste buds. Fried with their perky tail will make you want and crave for more. Chicken pieces marinated in a homemade thai spicy sauce and seasame seeds wrapped in banana leaves and deep fried. Crumbed golden fried tail less prawns tossed in our special wasabi sauce served on a bad of lollo rosso lettuce. Prawns battered and deep fried to golden perfection and tossed with a honey-mayonnaise light dressing. Sounds really simple but they are so addictive. A refreshing thai spicy curry based shrimp soup served with lemon grass kaffir lime leaves galangal & straw mushrooms. Rice coconut cream with tender pieces of chicken in a combination of fresh kaffir lime leaves, galangal lemon grass and straw mushrooms. A hot and sour soup with a delightfully different thai flavor. A warm comfort chicken soup with our home-made chili paste and lime vinegar. A soup with fresh basil and ginger. A thai glass noodle soup with a spicy broth. A thai combination of fragrant lemongrass, kaffir lime leaves and galangal. These three flavor beautifully blended with chicken, thai herbs, straw mushrooms and rice noodles. Most popular thai salad with fresh greens, thai spices, fresh herbs and roast beef slices tossed with dressing of lime juice, thai chili peppers garlic & original palm sugar. Refreshing, grilled prawns with a honey chili dressing, tossed with fresh spring onions, tomatoes and roasted peanuts. A tasty crispy salad with deep fried prawns fried chicken and spring onions dressed to perfection. This beef salad recipe offers a feast of flavours textures with every bite. Aged and fermented red chili paste cooked with red onions in spicy Hunan style sauce. Szechuan style cooking is mostly known as spicy and stimulating, very few people know that heavy use of garlic and soya in a rich sauce also represents the Szechuan style cooking from the western region of china. A dish from the eastern region of china but modified to Lahore's typical taste. Cantonese style black pepper sauce, prepared with mixed vegetables. Meats and mixed fruits cooked in sweet, sour spicy Manchurian sauce. A szechuan classic. A spicy stir-fry dish with peanuts, vegetables and chili pepper. Sliced chicken wok fried and served in a chinese gravy. Sliced chicken wok fried pieces with the sweet flavoring of Red cherries and Pineapple slices make it a great entree served in a chinese gravy. Seasoned with Chinese five spices and deep fried. Cantonese style. Your choice of meats prepared with mixed vegetables and toasted almonds. A beautiful blend of spice in soya, oyster and rice vinegar. A perfect blend of just enough sweet & sour sauces, bring out the favor of the day. This lighter take on braised chicken combines well with vegetables. A family favorite. These shrimp balls dish is sure to become a favourite. Simply delicious! Sumptuous, timeless and classic prawn dish prepared with garlic and spring onion. For replenishing qi (essential energy) to nourish the blood and claid the nerves. A curry with authentic taste made with Thai green chilli. Seasoned and marinated in Thai spices, work fried in authentic Thai curry ingredients. Tempt your taste buds with our tangy sweet and sour sauce. Cooked with coconut cream, fresh Thai chillies coriander leaves and oyster sauce. A Thai treat! Wok fried in Thai herbs and spices with spinach leaves, basil lemon grass galangal and spring onions. A delicious dish with a touch of sweetness combined with lemon grass. Cooked in a blend of lemon grass, kaffir lime leaves and authentic Thai spices. Sumptuous succulent stir fried in the original chilli sauce. Simply a timeless and classic Thai dish. A blend of Shangai and Thai style cooking lightly stir fried in a wok. A beautiful and fragrant dish stir fried in a combination of Thai green chilli, galangal, lemon grass and and kaffir lime leaves. A very rich sauce simmered with fragrant spicy ingredients, garlic ginger chilli paste, a citrus mixture and a combination of fresh spring onions. Opium homemade teriyaki sauce brings the strong teriyaki flavor to the ingredients. A soya garlic flavored japanese grill served with toasted sesame seeds. It doesn't get much better than this. Mongolian chicken is nearly the perfect Asian recipe. The recipe is all about the sauce. The sauce used a combination of hoisin sauce, soy sauce, and oyster sauces for a nearly perfect combination of flavors. Opium's Bangkok chicken we can't live without. A famous Thai creation of our Chef. Stir fried with fresh basil. A colourful combination of chicken with capsicum , green onions, mushrooms, basil , garlic and oyster sauce. Fillet of sole, served with cheese potatoes and sauteed vegetables. Fillet of fish served with cheese potatoes and sauteed vegetables. The British national dish loved by everyone. Our original recipe, only the way Opium does it with cold cuts of chicken, Turkey bacon slice etc. A choice for the burger fans with a crispy and lean chicken breast topped with crunchy lettuce and cheese. Opium finger fish is prepared from our select fillet of fish, seasoned and crumbed, deep fried till golden brown. Chicken, Beef, Shrimp, Pepperoni, Capsicum, Onion, Jalapeno, seasoned with Opium's secret spices and cheese. Chicken Fajita, Onion, Jalapeno, Capsicum. Special baked chicken, Capsicum, Onion, green/black olive, mixed cheese. Cabanossi, Onion, Fresh Tomato, Black Olive, Cheese. Capsicum, Onion, Fresh Tomato, Black Olive, Cheese. Capsicum, Onion, Fresh Tomato, Black Olive, Sweet Corn, Cheese. Are you tired of all the ‘desi chinese‘ eateries that claim to serve Chinese food but are basically full blown desi flavoured? We know we are! So if you are like us, you must be wishing for an authentic Chinese and Thai food experience. Lucky for us, Opium is here to save the day. Opium restaurant is an authentic Chinese and Thai food restaurant. The food is carefully prepared to keep in mind the true flavours of Chinese and Thai cuisines. Another great thing about Opium restaurant is that the vegetables and ingredients used at the restaurant are especially imported from Thailand. Also, the owner of Opium has his own garden where he grows some of the ingredients. You can clearly see his dedication and passion in bringing us exceptional food. What’s hot in the ‘House Specialities'? 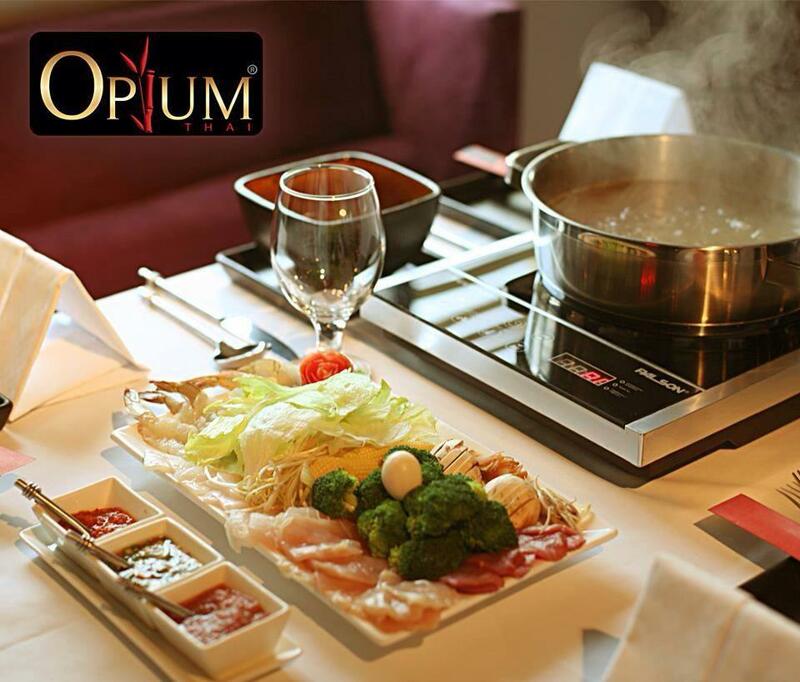 If you haven’t tried the Opium Hot Pot from the house specialities menu, you haven’t lived! It has assorted seafood, raw meats, sea fungus & seasonal vegetables served with a broth. The stir fried lobster is also something that should be tried by everyone at least once. Other specials include the steamed whole red snapper, deep fried whole red snapper, caramelized tamarind fish, and the seasonal vegetables in garlic butter. Undoubtedly, the best Thai food is available at Opium. The menu is huge so you would be tempted to order everything! From the thai soups menu, you have the option to order tom yam goong, thai chicken hot and sour, tom kha gai, and several others. A hot and steaming bowl of soup will brighten those dull winter days for sure. The thai chicken and beef entrees also have so much variety. So if you are someone who enjoys variety in life, this will make you super happy! Some noteworthy chicken dishes are the red curry chicken, thai chicken with basil and coriander, thai sweet and sour chicken, Opium om ka chicken, thai honey glazed chicken, and many others. Some of the beef entr’e specials are dry chili mint beef, chili lime stir fry beef, Japanese beef teriyaki, Mongolian beef, and basil beef. All ingredients are super fresh, making the overall dish off the charts! I think by now you have realized that ordering from Opium is the smartest thing to do. Gather your family and friends so that you can share the authentic Thai and Chinese food experience with them. You don’t even need to drive all the way to the restaurant and worry about getting that perfect parking spot. Just order through Cheetay by visiting the website or downloading the app. And enjoy!